There are many ways of giving to WOU, and it does not have to be a monetary gift. We appreciate and value your participation and involvement in the WOU community from attending alumni events to networking with current students. Are you interested in being actively involved witht the WOU Alumni Association? Active involvement can happen in a variety of ways and does not always require a lot of time. Opportunities are endless, and we are grateful for whatever time or skills you are willing to contribute. If you are interested in becoming involved in any way, please email the Alumni Relations office, and we will add you to our contact list for future events. *Currently, the Alumni Association is seeking alumni interested in connecting with current WOU students (future alumni) to help ease the transition between student life and the post university atmosphere. If you would like to network and share information about your degree and how it led to your current occupation, please email the Alumni Association or contact us at 503-838-8710. Monetary gifts are handled through the WOU Foundation. The WOU Foundation accepts gifts for any approved program, department, or activity at Western Oregon University. Contributions of $1,000 or more within a 12-month period qualify you for the President’s Club, you will be invited to be a guest at the President’s Club dinner. Many companies offer matching gift programs to their employees, employees’ spouses, or retired employees. Contact the personnel office in your company or call WOU’s Office of University Advancement at 503-838-8281 to find out if this program is available to you. Our online giving form is quick and easy. You can support Western Oregon University and its students by making a gift right now with your credit card. All information is encrypted and kept confidential. The WOU Foundation will send you a confirmation message and a separate paper receipt. Simply click make a gift online to get started. Or call us at 503-838-8281 to receive more information about giving to WOU. Do you know a student who would benefit from a $1000 scholarship? You can assist a current or future WOU student in obtaining this scholarship in two different ways. 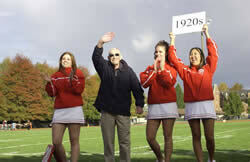 Applicants must be referred by you, a current member of the WOU Alumni Association. This scholarship is funded through alumni donations. Make an online gift now. Find out more about the Alumni Association Legacy Scholarship.